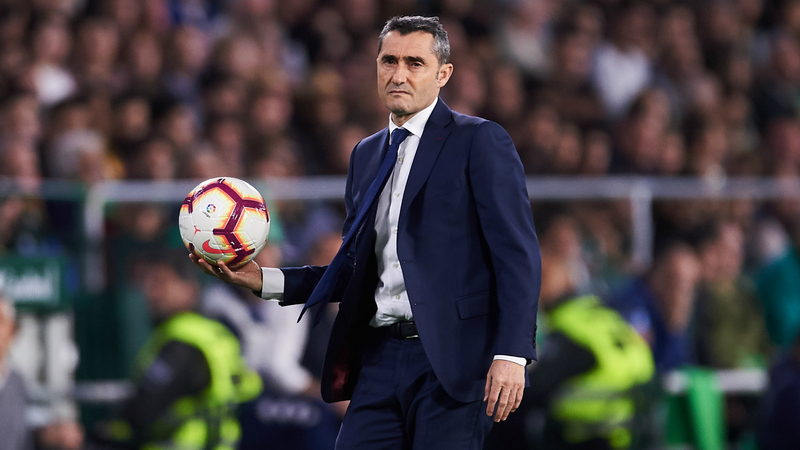 Ernesto Valverde stressed Barcelona have not won anything yet but accepted a 4-1 win at Real Betis was an important step in their LaLiga title defence. With Atletico Madrid beaten 2-0 at Athletic Bilbao on Saturday, Barca triumphing at the Benito Villamarin the following day moved Valverde's men 10 points clear at the top. Lionel Messi scored a fantastic hat-trick on the day he claimed the record for Barca wins with his 477th victory for the Calatan club. But their victory was marred by an ankle sprain sustained by Luis Suarez, who scored Barca's third goal, the striker needing to be substituted in the closing stages. Valverde has regularly rejected suggestions Barca are targeting a treble but with his side in such a strong position in LaLiga and already into the Copa del Rey final, suggestions they could add the Champions League to the domestic double they won last term is inevitable. And Valverde conceded Barca are now closing in on a second LaLiga title in two years since he was appointed as the successor to Luis Enrique. "After the result of Atletico Madrid, the three points against Betis were very important," Valverde said. "There are still 10 games and we have to be careful and keep going, but we have taken a very important step and we will see if it is enough to be champions. "The good thing is that we finished this stretch of intense matches of recent weeks, now comes the break and after there are 10 games left, each time we pass one and win it, it will be an even more important step. "Everyone can think what they want, but at the moment we try to win every game, first the league, then the cup and we'll see about the Champions League. But at the moment we do not have any titles, and in the league there are 30 points left to fight for, we have to keep pushing." Valverde switched from Barca's usual 4-3-3 to a 4-4-2, bringing in Arturo Vidal, and he was happy with the way the tactical change helped Barca win the game despite having less of the ball. "We knew that they would play an intense match and with high pressure, they already did it at Camp Nou," he added. "We did not want them to take control, in the first game they passed us, when they scored four goals. "When you change something, it's to improve, to be able to win and we've won, it seems that it may be due to that, but in reality it's due to the efforts of the players."